"Planet: Earth, City: Tokyo. Like any great metropolis in the planet, Tokyo today is found at disadvantage in its struggle against mankind's greatest enemy: pollution. And in spite of the efforts of the entire world, there may come to pass a day when the soil, the air and the waters will become lethal to all forms of life. Who can aid us? SPECTREMAN!" So began the battle of Spectreman to protect mankind. Pollution, however, was not the only problem that needed to be dealt with. There were those who would use it to destroy mankind for their own nefarious purposes. Especially a simioid from a distant galaxy known as Dr. Gori. In a Tokyo subway station, a man makes his way outside. He is Gamou Jouji, and he has a secret. As he leaves the station and looks straight up into the poluted sky, only he can see a giant UFO hidden from normal eyes. The UFO belongs to a race known only as The Dominants, and Jouji is not afraid. He works for them. They call him Spectreman. Hailing from Nebula 71, the Dominants are strict enforcers of the Galactic laws governing and protecting all planets. It is not uncommon for them to assign special agents to primitive planets in order to prevent these worlds from self-destruction. Spectreman is such an agent, and to function at his most efficient he is given a human identity in order to observe Earth and best fulfill his mission. Thus far his mission had been one of observation, but now strange things are happening to Earth, more specifically to Japan. Unusual biological developments originating from man's pollution of the planet are evolving into dangerous threats to all living beings. The Dominants can locate these mutations, but to better approach them, Jouji needs to do his own detective work. Therefore, he employs himself in the one agency that will always be on the scene: The Pollution Control Division. To say he "employs himself" is quite correct! His first day at work involves busting in on the agency, choosing his own desk and telling his "boss" he is their new man. Brash young fellow. Normally this would cause most people to get escorted out by security but Jouji is very good at appearing to be indispensable. In this case he warns them that something foul is going to happen in Tokyo Bay by 7PM. His guess is correct and the KOHGAI G-MEN (Pollution G-men) go investigate. This is the first mission of Spectreman on Earth in his full capacity as its protector. The Tokyo Bay emergency turns out to be only the first of many such ordeals wrought on Earth by the simioid genius, Space Apeman Gori. Who was Dr. Gori? In his technologically advanced home planet of Epsilon, Gori was a scientific genius of great prominence. His achievements led him to being chosen by the people as their leader. However, this was not enough for Gori. His ideals represented a social mutation to the norm, he believed that their superior technology was meant to be used for war and intergalactic conquest. His plans made obvious, Gori was tried and sentenced to re-education, a process where his desire for evil would be excised from his mental patterns. There was no death sentence in peace-loving Epsilon. Gori was never to fulfill his sentence, because a like-minded army officer named Rah helped him escape. In gratitude, Gori made Rah his right-hand man. Together they drifted throughout the galaxy for a long time until they reached the Earth. Earth, which looked like a blue emerald in space. Gori was captivated by its beauty and decided it would belong to him. The fact that billions of humans were already there didn't influence his decision much, and so he set upon conquering the blue planet. In fact he despised humans because humanity had been blessed with the most beautiful planet he had ever seen, yet they ruined the air and the water and littered the land. So was the setup for SPECTREMAN. As unusual as it sounds, the show's original title was SPACE APEMAN GORI (UCHUU ENJIN GORI). It maintained that title for the first 20 episodes, then changing to SPACE APEMAN GORI VS. SPECTREMAN on episode 21, and finally on episode 39 to simply SPECTREMAN. The decision to name the series after its villain may have been, in my opinion, a way to cash in on the success of the PLANET OF THE APES movie series, a hot property back then. Every week for 63 episodes Gori would concoct a monster out of human garbage, or living beings and pit it against our hero. Occasionally other aliens would appear to cause mayhem, sharing Gori's view that humans were nothing but pigs. Jouji and the Pollution G-men would investigate the going-ons and when in real danger, he would transform into Spectreman. Jouji could not transform at will, however. His power came from the Dominants' spaceship and he needed to ask permission in order to transform. Once granted, he'd acknowledge his superiors with a somewhat nazi salute and transform saying "Ryoukai!"("Roger"). Often the request would be denied for various reasons, sometimes leading Jouji to revolt against his masters and nearly becoming minced cyborg meat. 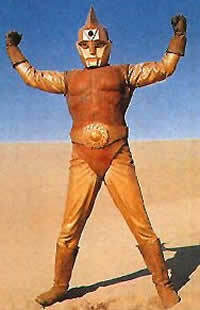 Spectreman was "fired" by the Dominants at least twice, once being sentenced to exile on a desert planet. Luckily for him, sending a replacement to Earth from Nebula 71 would take a fatally long amount of time and the Dominants would reconsider if he had learned his lesson. In episode 15 the Dominants prove to be nearly godlike in powers, being able to control even time itself. This makes one wonder why they employ Spectreman at all and don't just destroy Gori themselves. In human form Jouji was fired and rehired by his Pollution Control Division boss, Mr. Kurata, almost every week as well (in the early episodes), which means his employment history is rather shaky. (His relationship with Kurata would be mirrored by reporter Carl Kolchak and his editor Tony Vincenzo years later in the classic "The Night Stalker" american tv series). The boss is quite a character. He is very dependable and a strict boss, but he has a knack for being understanding of his employees and never loses his cool even as the world is literally falling apart. Definitely the father figure in the agency, he is shown to have a family and in episode 15 his son was saved by Jouji from a crumbling building. That episode, by the way, has a real puzzling conclusion but it shows the true powers of the Dominants. Membership of the Pollution Control Division remained stable for the most part, with the only change being the occasional female member leaving the team. It gave the impression that women cannot handle being around pollution as easily as men. It is a shame because the first ten episodes treats us with one of the sweetest, most memorable female member of a support team ever in tokusatsu. This was Rie, played by Konishi Machiko. Sporting a very unique look, a bright and spirited personality, Endo Rie battled wits with her co-workers, flirted with Jouji and the occasional guest star, was threatened by Rah who apparently found her attractive, and was ultimately never seen again after episode 10. In some episodes, Rie donned sunglasses identical to those that would be worn later by Ban Daisuke as Jiro in Jinzou Ningen Kikaida. Her dressing style was vibrant and youthful, even her hairstyle was non-conformist and changed often. Female team members who followed simply could not compare, and didn't stay on the show very long. I suspect this is because none of them were as charismatic. According to August Ragone of Henshin! Online, there is a rumour that Konishi Machiko had to leave the show due to her husband's illness, from which he did not recover. A sad tragedy in the life of the always smiling, cheerful Rie. It is arguable that Jouji's best friend was Kaga (Kato in the Brazilian dub), the bearded guy with curly hair. In the beginning Kato is very suspicious of Jouji's motives, but later on the two of them got along great. By episode 19 Jouji is apartment-hunting for Kato, whose wife is pregnant. It seems the landlord of Kato's original place had a thing against children. Sadly, so did Dr. Gori who endangered the Kato family with a giant termite monster. In an episode where it was believed Jouji was dead, Kato cried the apparent loss of his best friend. There were two more male members of the team. The agile and athletic Arito, who finally found an outlet for his physical skills after the team's mission changed to that of a more active capacity; and the portly Ota. Starting around episode 40, the boss announces major changes to the department's mission. They will publically appear to be in control only of pollution matters, but their secret side mission is to battle monsters originated from pollution. For this, new equipment is introduced and a new female team member is assigned. The new equipment consists of helmets, one of which has a warning light and is worn only by the girl, laser guns, and communication systems. The boss then says that if anyone is unhappy with the change in the agency's job, they are welcome to leave. The team is cheerful about going from paper-pushing to actually doing something exciting. and everyone stays. Although there are comments like "Say, how come Jouji is never around when Spectreman appears? ", the team members don't really catch on to his identity. They are suspicious enough, but in episode 50 a Spectreman duplicate appears to fight off the Cobalt Monster. Jouji is with the team this time and whatever suspicions they might have are buried. Jouji, however, knows something is wrong, after all HE is Spectreman. In episode 51 the two Spectremen face-off. The only way to tell them apart is by the colour of their belts. When one of them is injured, he bleeds. I think P-Productions could not decide on a colour of blood for him. In some episodes he bled yellow, in others, green. Since Spectreman is a cyborg, I chalk it up to the fact that, much like a car, his body has different fluids in different areas. Coolant fluid, oil, and other substances probably flow through his circuits. It is never really explained what Spectreman's real form is. My opinion is that Jouji is his real form, but with cybernetic implants which permit his transformation into Spectreman. This is plausible, as in episode 2 Spectreman loses his robotic head, but Jouji was not decapitated. In later episodes Jouji is seen eating and enjoying Earth food, and on others he hooks up to a machine supposed to recharge his run-down power source. The original theme song describes him as "robotto cyborg", which implies he has organic composition with cybernetic enhancements. However, in episode 35 when he is injured and taken in Spectreman form to the Dominant's spaceship, we finally get a glimpse of his superior, who looks just like Spectreman, but with a different crest light. This means the dominants remain in Spectreform while in space, I believe. I also believe that remaining in that form doesn't necessarily drain energy, I think an energy drain comes from fighting or over-exherting. When Spectreman was exiled his body kept his Spectreman form. But whenever he fights to exhaustion he becomes Jouji again. On occasion he is drained of energy and just becomes human sized while still maintaining the Spectreman form. Unlike many other heroes, Spectreman doesn't really use a huge amount of energy weapons. They seem to drain his power, so he has to engage in physical combat. His main energy weapon is the Spectre-Flash (SUPEKUTORAFURASHU), which sometimes resembles a rainbow. Late in the series the effect became more like a yellow beam. His other weapons include his multicoloured shuriken (throwing stars). It is not clear whether the different colours have different properties, it seems they all just do the same thing. The noticeable exception is in episode 51 where a shuriken has the unusual ability to become gigantic and decapitate a monster all by itself, carrying off the head. In at least one episode, the Dominants sent him a sword and a shield. These had limited success, which is probably why we don't see them a second time. What we see often is the Slice (SURAISU), a set of serrated blades on each of his gauntlets. These add to his damage ability in melee combat. Dr. Gori was a weird villain. We could sympathise with him to a certain degree because he was right in relation to what we were doing to the planet. On the other hand he was the personification of the banality of evil, in the way he disposed of humans as if they were flies to be swatted. There was nothing banal about his personality, just the way he regarded humans as insects. Rah shared this attitude with Gori, disposing of humans without a second thought. Sometimes Gori would do evil things to animals as well and that made me mad. I'm the kind of person who'd risk jail to save an animal from human cruelty. Still, episodes 48 and 49 are among my favourites. In this two-parter, a scottish terrier is turned into a giant monster and ultimately destroyed by Spectreman. This was not done in a completely exploitative way, as we learn to like the dog early on in the story, and his owner really cares about him. Titled "The price of genius", this episode dealt with an amazingly unintelligent young man named Tadao who works delivering take out because he is considered too stupid for another job. Simultaneously, a scientist has a breaktrough in neurosurgery that increases the intelligence of a dog, his scottish terrier Bobby, to that of a ten-year old human boy. Upon hearing of this, Tadao gleefully volunteers to have the procedure done to himself. The doctor finds him a perfect choice for the experiment and agrees to operate. Tadao is a very sweet, very nice innocent young man who plays with children and likes to play on the swing set. There is no trace of violence on him, he gets called a retard by the children yet the children like him because he doesn't take it to heart and smiles at them as they race him down the street. It seems Tadao lost his mother when younger and no one cared to educate him. Tadao regularly makes deliveries at the Pollution Control Division office and Ota is impatient with his lack of wits. The other team members treat him nicely, including Jouji, who is concerned about the operation and has a bad feeling. His fears prove justified when Dr. Gori implants a mind control device in the doctor, causing him to add certain ingredients to his brain enhancement formula. The operation is considered a success and Tadao shows up at the G-men's office in a suit, bringing them all a gift and saying he's going to college to become a brain surgeon! Chief Kurata jokingly says "If you ever operate on me, be careful, ok?!". Everyone is happy for him, including Jouji but he has a sixth sense that tells him something bad is going to happen. After two more surgeries, Tadao's intellect has grown way beyond genius and now he graduates from the university in a matter of months. He writes papers and publishes books and revolutionises medicine. Throughout all this, Tadao's best friend is the dog, Bobby. They are seldom separate and go everywhere together. After a surgery, the dog usually is in the hospital room with Tadao. They are best buddies and bring happiness to each other's lives. That is, until Bobby starts developing an appetite for raw meat. One night in the lab the dog attacks and eats a live bunny. He then starts turning into a giant monster. This is a rather violent entry in the series. The dog destroys part of the university building and bites off the head of a nurse as if she were a chocolate bunny! Then he throws her body at the feet of the Pollution G-men, which prompts the female member to say "he ate her head!". Thank you, Queen of the Obvious. Tadao is desolate and begs the gigantic Bobby to stop. Unfortunately the monster is out of control, so Jouji transforms into Spectreman and fights Bobby. Spectreman severs the monster's arms and finishes him off with Spectre-Flash. Tadao holds a funeral service for the dog and cries at his grave. This is done very tastefully and as a child I remember crying in this scene. It still moves me today. But it doesn't end there. Tadao is now afraid he will become a monster, so he spends day and night studying to come up with an antidote. Jouji comes visit him and Tadao tells him he knows Jouji is Spectreman. It is no use denying, Tadao is now developing paranormal abilities. Luckily for Jouji he was indoors when Tadao told him this, because one of the points of the show is that if anyone finds out he is Spectreman, he will be forced to leave Earth. Being indoors, the Dominants do not hear this. I won't tell you what happens later, but it is a very powerful, very poignant episode, with really interesting character development and wonderful acting, especially by the Tadao actor. According to Stuart Johnson: "In [DINOSAUR PRINCE] a plane crashes. A man, a woman and one of two infant sons are rescued and make it back to Japan. The other twin is thought drowned but he actually survives to be raised by dinosaurs. Years later, the island the boy lives on is invaded by aliens from another planet. They kill the mother dinosaur which protected the boy. The boy and the dinosaur's offspring fight the aliens and their giant monsters. The Japanese send troops to the island to fight off the alien invaders too. They discover the boy. He spends some time with his family but escapes to return to the island. The two boys were played by actual twins. Later a soldier who carries a samurai sword joins the troops. He's played by the Riderman actor who also stars in Denjin Zaboga later. The first group of alien warriors are defeated but a new group appears." SPECTREMAN really started life as ELEMENTMAN, and a pilot was shot by P-Productions with Dan Jiro as the main character. It is well known that the pilot bombed, and they went back to the drawing board, while Dan Jiro went on to immortality as Go Hideki in RETURN OF ULTRAMAN (KAETTEKITA URUTORAMAN). The design for Elementman was radically different, he looked like Marvin the Martian, with his red uniform. The suit actor's actual mouth could be seen through a "Captain America" style hole in the mask. Like the movie GODZILLA (GOJIRA, 1954), the original intention was to be inovative and have Elementman battle stop-motion monsters, however, the budget constraints and the hectic shooting schedule made them change their minds and go back to the tried-and-true rubber suit techniques. 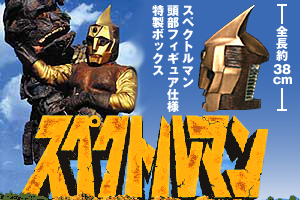 All that remains of this can be seen in the first episodes of SPECTREMAN, particularly a sequence in the opening titles where a glimpse of Elementman can be seen behind the stop-motion monster. I guess they never thought people would notice. Spectreman was not the only one who was different in the pilot. Gori did not look much different from Rah himself. The original Gori suit was recycled into Kah (named Rah No. 2 in the orginal japanese), the assistant Dr. Gori creates from a gorilla he steals from the zoo in episodes 5 and 6. The overhaul on Gori's look might have been influenced by the character of Dr. Zaius from PLANET OF THE APES. In that movie, there were three castes of society. The peaceful chimps, the warmongering gorillas and the intellectual orangutans. The orangutans had blond hair, albeit not as blond as Dr. Gori's, and pursued scholarly endeavours. The radical difference in appearance between Rah and Gori hints at a similar society in their homeworld. Either way Dr.Gori's makeup was never really believable and obviously a far cry from the prosthetic wonders of PLANET OF THE APES. Gori is also said to be a "mutant" but this might have been a social trait rather than physical. We see a shot of Gori's trial and the judge is obviously similar to Gori in appearance (and likely the same wig). In early episodes Gori's arm is identical to humans in spite of his head being simioid and its hue greenish dark. Gori's sycophant henchman Rah is quite the funny character, although he is not to be played with. Rah often kills humans without any mercy. Yet there is a strong comical side to him, especially his attempts at disguising himself so as to be inconspicuous. In the opening credits you can see him monkeying around. A running gag is his attempt to emulate Dr. Gori's incredibly over-the-top hand gestures and either failing or getting called a bumbling idiot by his master who thinks he's gone nuts. Boiling inside the ape suit was celebrated suitmation veteran Uenishi Koji, the same suit actor that played Spectreman in the action scenes, and whose most memorable suit/stunt work had been in the role of ULTRASEVEN. Occasionally someone else would be in the Rah suit because there were scenes where both characters appeared together and fought. The Rah suit was very well done early in the series, and less effective towards the middle when the original was replaced. Rah went from being black to brown. Perhaps just as noticeable to japanese viewers is the fact that Gori's voice changed. 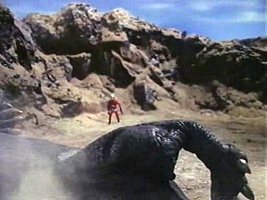 Some monsters were carried over from the pilot into the first few episodes of SPECTREMAN. They had also been used in another failed P-Productions title, "JAGUARMAN" (JAGA-MAN). That hero himself was recycled in 1973 as BLACK JAGUAR in the LION MARU series. Recycling is quite common in tokusatsu. Although SPECTREMAN was not a big offender in this trend, there are occasions where parts of monsters are re-used in other monsters. 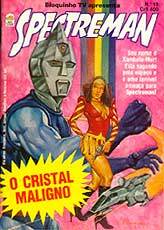 While often seen as an ULTRASEVEN ripoff, SPECTREMAN was nevertheless a worldwide massive hit with children in its international syndication phase, especially in South America where it ran daily until 1989. The show was acquired by an American company and given a new, exciting theme song. While it was not unusual for imported shows to get new themes, SPECTREMAN was lucky in that the song was actually as good as the original. The 70s hard rock guitar theme is remembered by most international fans as being THE Spectreman theme, and many have never completely heard the original "Spectreman Go Go Go". 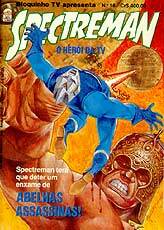 Without a doubt Spectreman was extremely popular in Brazil, given a wonderful portuguese dub by extremely talented voice professionals, even though the technical aspects of the job left something to be desired. The voice of Rah was even better than the original's, infused with a put-upon personality. The success of the show in Brazil spawned a comic book series, which unlike the original manga, was drawn in a Marvel/DC style by the now defunct Bloch publishing company. The comic ran for years and was a hit with children, even though it had severe differences from the tv show. Spectreman was silver and blue, instead of gold and brown. Dr. Gori was black-haired (!) and some names were different. The comic was actually licenced, so it is hard to understand why it was made to look different. Maybe someone was colour-blind. It was drawn by the team of Eduardo Vetillo, sometimes with beautiful oil painted covers. Those are sought-after collector's items nowadays, reaching high prices in online auctions. "While both Kazumine Daiji and Ushio Shoji were manga artists, they are not the same person. In the original SPECTREMAN manga published by Akita Shoten, the inside back cover of the dustjacket featured a photo of both Kazumine and Ushio, and neither of them look like the other in any way, shape or form. There have also been several retrospective books on SPECTREMAN and P-Productions, which feature interviews and photos with both men, also busting this myth, such as SPECTREMAN VS. LION MARU (Ota Shuppan, 1999) and the recent reprint of the original SPECTREMAN manga by Kadokawa Shoten. The entire series was released recently on japanese DVD, in a beautiful case shaped like a 1/1 replica Spectreman mask.